It might not be the ‘tour de France’ but the ‘tour de Cymru’ has helped raise £33,000 for local charity 2 Wish Upon A Star. 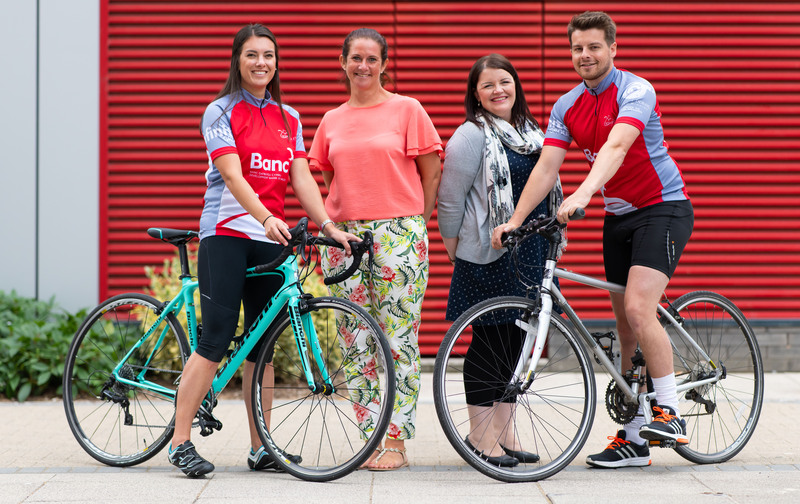 18 staff from the Development Bank of Wales completed a mammoth 280-mile cycling challenge, which incorporated all 22 local authorities in Wales. Their fundraising brings the total raised to £33,440 for 2 Wish Upon A Star, named charity of the year 2017/18. Other highlights of the fundraising by staff during the year include a circus-themed charity ball, sports day, cake bakes, quiz and raffles. Rhian Mannings Burke set-up 2 Wish Upon A Star in 2012 having lost her son George shortly after his first birthday. Just five days later she also lost her husband Paul. Following these tragic events, Rhian found incredible strength to set up the charity to ensure that suddenly bereaved families receive adequate support. She said: “We cannot thank the Development Bank of Wales enough for their amazing support over the last 12 months. It was Angels Invest Wales operations manager, Emma Phillips that first nominated 2 Wish Upon A Star as the chosen charity for 2017/18. She said: “It has been a fantastic year for fundraising and I’m incredibly proud of all that we have achieved for Rhian and the team at 2 Wish Upon A Star. Sian Price, Strategy Team Manager, who leads our responsible business activities said: “Our fundraising makes a huge difference to the charities that we support. We also have a successful community outreach programme with two teams having participated in Business in the Community Cymru’s Action Days 2018. The Cardiff-based team volunteered to improve the playground at Ysgol Gymraeg Casnewydd, whilst the West Wales team undertook some DIY and gardening at Bryncoch Church in Wales Primary School in Neath. It was hard work but worth every minute of effort to see the end results. The Cystic Fibrosis Trust funds cutting-edge research, driving up standards of care and supporting people with the condition and their loved ones. Gemma Williamson, community fundraiser for the Cystic Fibrosis Trust said: “I’m delighted we have been chosen as the Development Bank of Wales’ charity of the year and at the exciting plans they already have in place on our behalf. Action Medical Research and Derian House Children’s Hospice have also benefited with donations totalling £2,688 during 2017/18.